The furniture of the Shakers of old was designed to match their lifestyle. They valued functionality, durability, and simplicity. These values are clearly reflected in their workmanship. 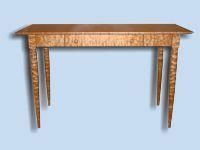 Delnero Furniture continues that fine tradition of quality craftsmanship in our line of Shaker furniture. Our Shaker pieces are known for their simple elegance and solid construction which emphasize the natural beauty of custom made real wood furniture. 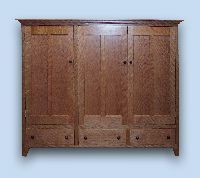 You may also be interested in our custom kitchens and custom kitchen cabinetry hand built in the Shaker style. To learn more about the history of the Shakers, the people that developed this popular style of furniture, be sure to visit the Shaker Heritage Society Museum in Colonie, NY. If you do not find exactly what you are looking for, please send us an inquiry. Custom Furniture means that we hand craft each and every piece to your specific choice of style, design, wood type, finish, and dimensions.